A superb original painting, full colour on silk, showing a beauty running in a late snowfall. Cherry blossom above. A leading artist of his time who produced some of the best bijin and kacho prints of the 1770s before concentrating on painting. Image size 40.25 x 14.25 in; 102.5 x 36 cm. Good condition. Painted c 1778. Signed Koryusai ga with seal Masakatsu, no in. An hashira-e showing nine cranes, a pine tree and the rising sun. A triple talisman of good luck. The tancho ( “red crest” ) Japanese Crane, Grus japonensis, is the second rarest crane in the world, migrating to East Asia in the fall to spend the winter. There is also a resident flock in Hokkaido. Much loved by the Japanese, the crane was a symbol of luck, longevity and fidelity. Rare: Another impression is illustrated in Jacob Pins, The Japanese Pillar Print, V & A, 1982, no. 518 ( which is also illustrated in the V & A Museum catalogue, The Floating World Japanese Popular Prints 1700-1900, 1973, no. IV8 ). Published c. 1770. 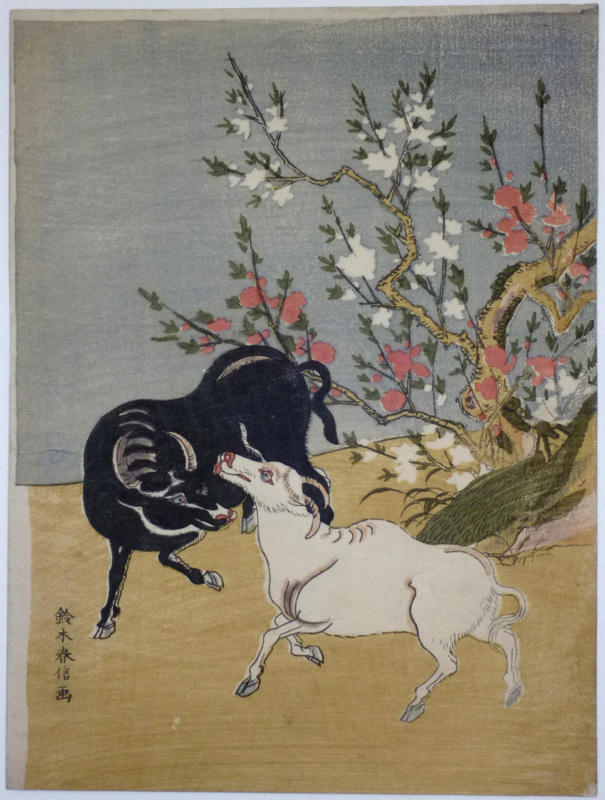 Koryusai was probably the most prolific designer of pillar prints, although he designed few kacho-e. Ex collection Seisuke Ikeda, 11 -12th April, 1910. Very good impression. Good colour. Slight fold marks ( as usual ) but generally good condition for a pillar print. 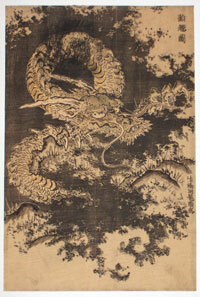 Signed Koryusai ga.
A dragon emerging from a muddy mire. Presumably a depiction of the dragon brought forth by Chinnan to produce rain in the parched village of Sogo. 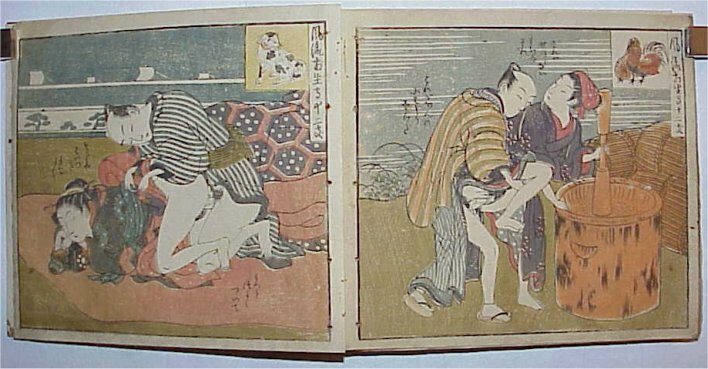 Koryusai copied a drawing or painting by Ganki ( top right inscription reads: ‘Painted by Ganki’ ). Extremely rare. I cannot locate another impression at present. Very good impression. Colour applied by hand: Sumi; green ( on fangs ); gofun ( on claws ). Sumi also scraped or brushed on to simulate sprayed mud. One or two repaired wormholes and signs of mounting au verso, otherwise very good condition. 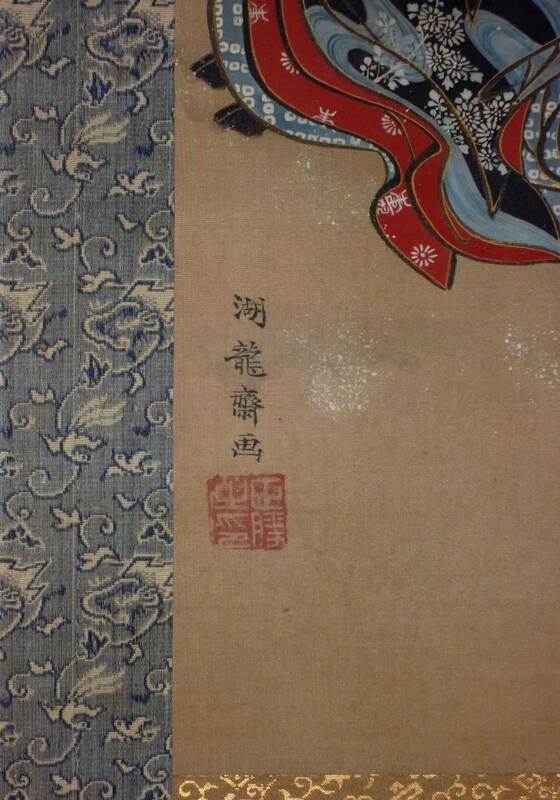 Signed Hokyo Koryusai sha ( ‘Copied by Koryusai’ ). A rare chuban showing a female monkey grooming a youngster, a waterfall behind. Saru, “Ape” from a set of “Twelve Elegant Signs [ of the Zodiac ] “. 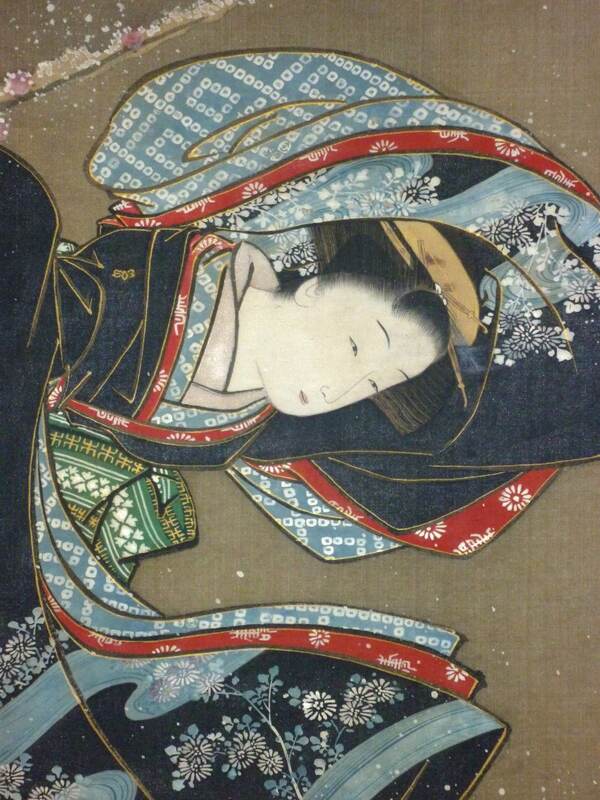 Koryusai produced some of the most exquisite kacho of the eighteenth century. Published c 1780. Very good impression and colour. Minor soil, otherwise good condition. 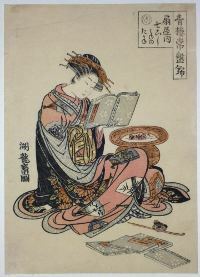 Signed Koryusai ga.
A chuban print showing the high-ranking courtesan Nanakoshi sitting beside a brazier reading a book. Her loose kimono has a design of fans (ogi – referring to her house, Ogi-ya). 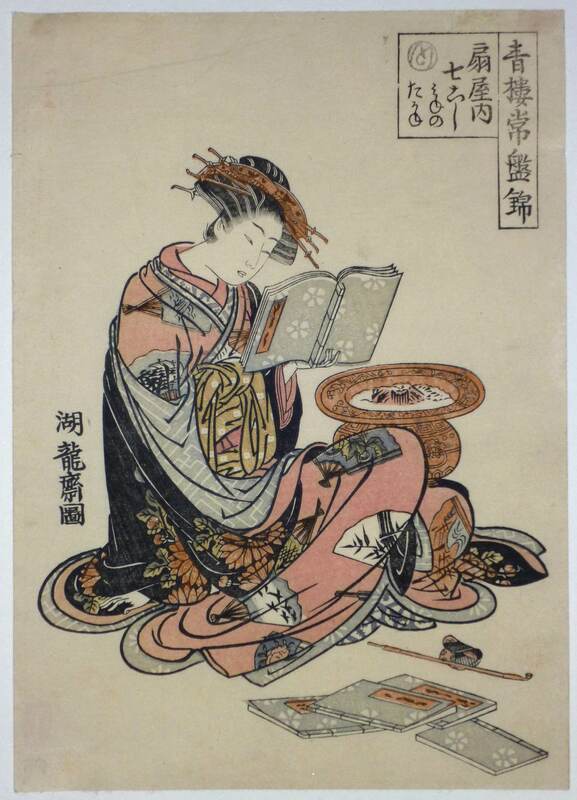 Koryusai was born a samurai in the service of the Lord of Tsuchiya but became an ukiyo-e artist producing many fine prints – especially kachoga – books and specialised in painting after c 1780. Three collectors’ seals: M. & C. Forrer and au verso McCabe and unread. Fine impression and colour. Small thinned area, otherwise fine condition. Signed Koryusai dzu. 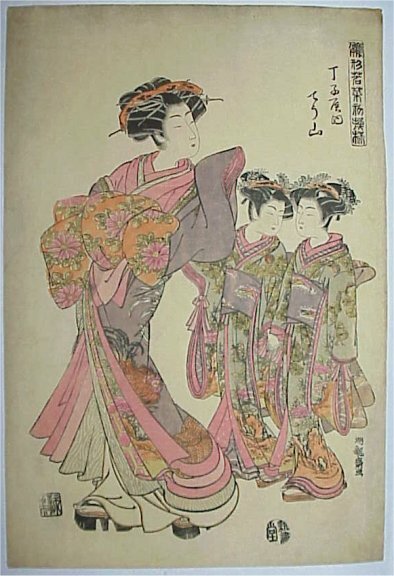 The courtesan Chozan of Choji-ya from the series: Hinagata Wakana no hatsu-moyo, “Models for Fashions: New Designs as Fresh as Young Leaves”. The set published c.1782. Printed on heavy hosho. Fine impression. Exceptional colour for a print of this series and date. Expert edge repair at centre left and slight signs of mounting au verso around edge, but otherwise a fine example. 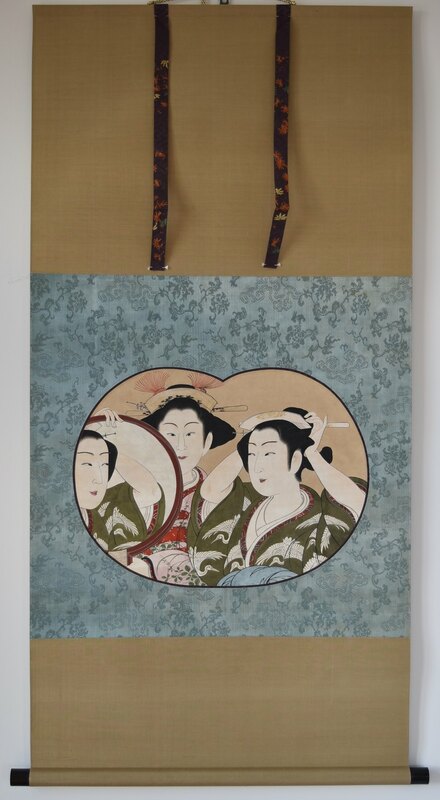 Signed Koryusai ga.
Two complete koban sets of twelve prints each showing loving couples. Two double pages shown from each album. Minor soil and one stain, but otherwise very good impression, colour and condition. 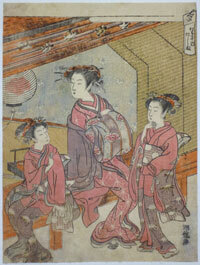 The courtesan Handayu of Naka-Omiya seated at a writing desk attended by two accolytes. 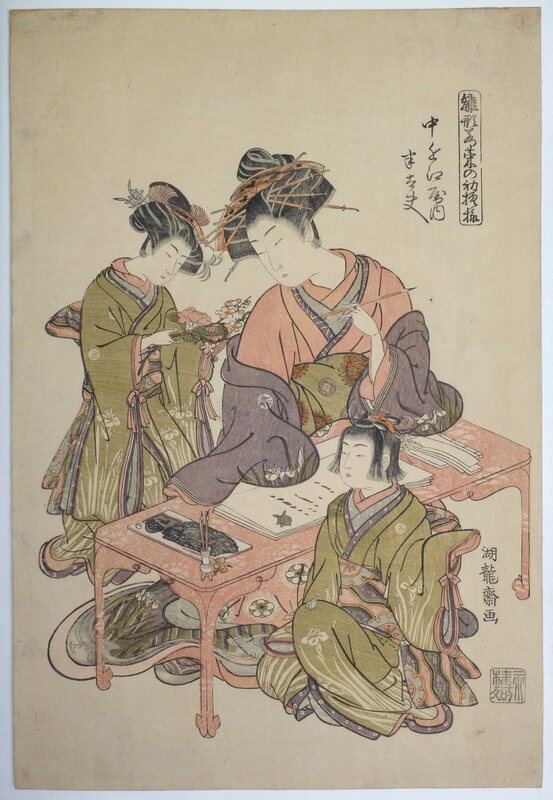 From a superb, large series: Hinagata wakanano hatsu moyo, “Models for Fashion: New Year Designs as Fresh as Young Leaves.” Published by Nishimura Eijudo, c 1776-7. Yoshida catalogues this set in Ukiyo-e, no. 26. A beautiful deluxe print. Superb impression on thick hosho. Very slight fading of red and expertly repaired binding holes near left edge, otherwise very good condition. 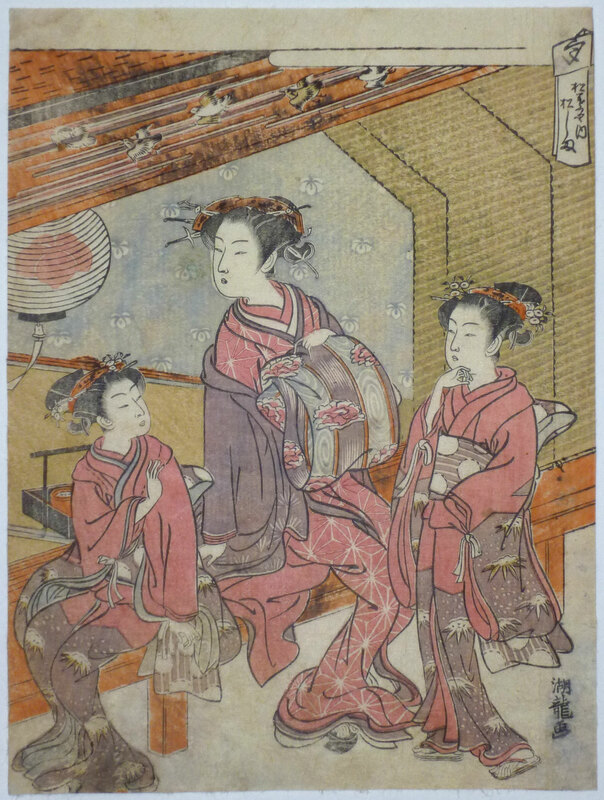 Koryusai ga.
A chuban print entitled Yu, “Evening,” showing the courtesan Matsushita of Matsubaya with two acolytes. Koryusai was an ex samurai. Well known for excellent and rare kacho and some fine hashira-e. Published c early 1770s. Ex collection Paul-Louis de la Noe, 1879-1919, ( an acquaintance of the Goncourt brothers, Bing and Hayashi ). Rare. Fine impression. Fine well retained fugitive pigments. Slight soil at bottom, otherwise very good condition. 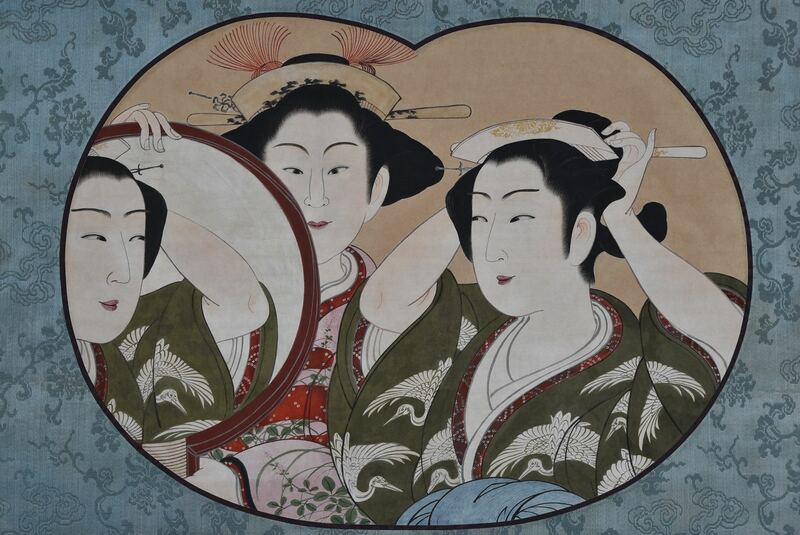 Signed Koryu ga.
A rare, highly talented and enigmatic painter who produced only a few masterpieces. There is some confusion over his active working life with differing dates from 1748 to 1780, but he was certainly painting in the 1760s. This unusual composition shows a beauty adjusting her hair by obliquely looking in a mirror held by her maid who stares unnervingly straight at the viewer. 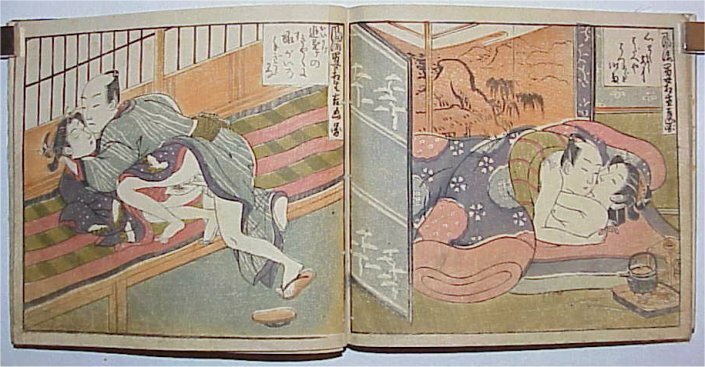 This painting is well known and is illustrated in Nikuhitsu Ukiyoe, Collection of Ukiyo-e Paintings Classified by Artist and Schools, Vol. 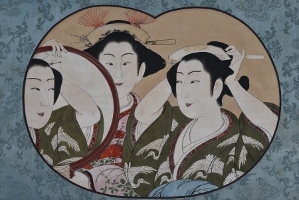 4 (of 10): Katsukawa school, Suzuki Harunobu and Isoda Koryusai, pl. 83, edited and published by Shueisha, 1982. It is also mentioned on page 113 in Ukiyo-e Large Encyclopaedia, Vol. 2, edited by Japan Ukiyo-e Society, published by Taishukan, 1982. Another Kanshi painting showing a beauty collecting bamboo shoots in the snow was exhibited at the Metropolitan Museum of Art, NY, in 2014, in an exhibition: The Flowering of Edo Period Painting: Japanese Masterworks from the Feinberg Collection. Full colour on paper with mica on the mirror, image size 14.5 x 20 in; 37 x 51 cms. In extremely good condition with double box. Painted c 1765. A falcon perched on a tree trunk above flowering camellias and a stream. 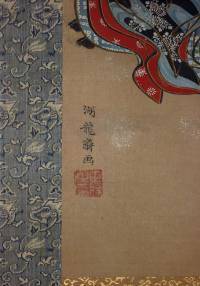 These kakemono-e lie somewhere between prints and paintings. The actual technique employed seems to have involved pressing dampened paper into engraved wood. The pigment is then applied to the raised areas; the print then being laid onto thicker paper and pressed home giving a crinckley surface. They have traditionally been ascribed to Koryusai although examples are known with other signatures. 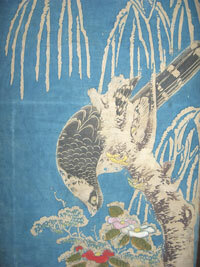 Another example of this design was in the Vever collection, Sothebys, Part 1, 26/3/1974, no. 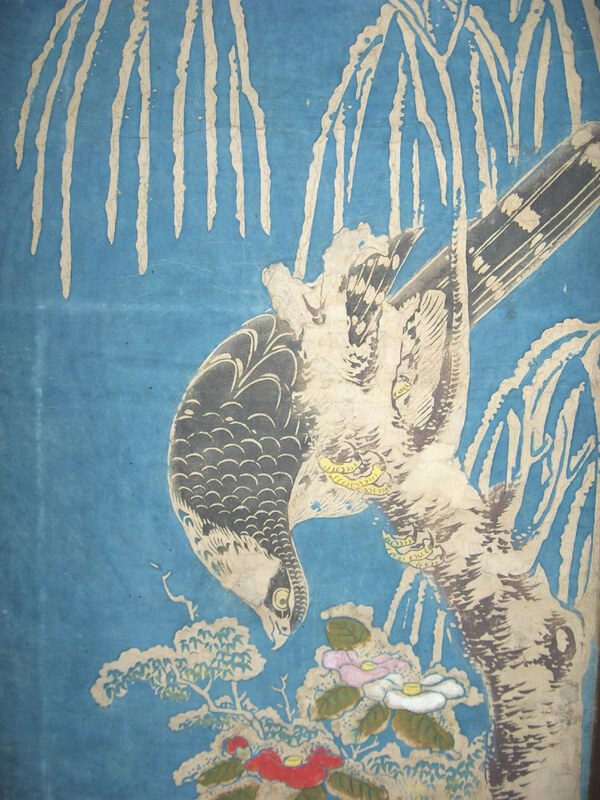 88, p. 69 where Jack Hillier states: ?The kakemono-e are however extraordinary technical and artistic creations, and the present specimen is one of the finest of the designs, comparable to the famous ?White Falcon? 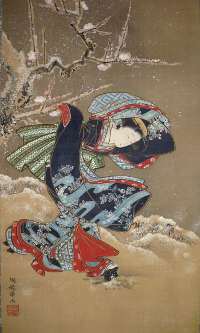 in the AIC ( Harunobu, etc., No. 181, p. 271 ).? ( That example appears to have been badly cut at the bottom. ) 35.5 x 11.5 inches, 90 x 29 cms. Mounted as a painting with rollers and box. Excessively rare.